Hosting Microsoft Access in the cloud is becoming more and more popular, and for many businesses it can be a far more flexible and cost effective way of managing and sharing business information than web based alternatives. However, many companies are unaware of how quick and easy cloud hosting Microsoft Access is, so I wanted to produce a couple of articles on the subject for both businesses wanting to run an Access database online; and also for commercial software developers building in Access who want to give their customers a low cost cloud based online database option without any investment or re-coding, this article is available here. In this article I’m going to concentrate on Access database cloud hosting using Microsoft remote desktop services (also known as Hosted Applications, Remote Applications, RemoteApps, WebApps or hosted terminal services). While there are other methods for example using hosted SharePoint in Office 365 I’ve not heard good reports about these. On a hosted remote desktop server platform, both the database and the front end application run on the same computer, a server in “the cloud”. The only thing that runs on the users local PC is a remote desktop client application which shows the screen view from the remote server and transmits the keyboard and mouse presses over the internet. As there are remote desktop clients for nearly all types if devices users can work on the hosted database application using PCs, Macs, iPads and Android tablets. The remote desktop client will allow users to run either a full remote desktop, or more commonly just the remote Access database application which launches from an icon on their Start Menu. It is also possible to run the Microsoft Access cloud application in exactly the same way straight from a web browser. Handy if you are working on a strange PC in a hotel or airport. As many users as needed can work on the database at the same time and because everything is running on the same server, if a user loses their internet connection there is no impact, no database corruption, they just pick up where they left off once internet is back. It’s worth noting that Hosted Remote Desktop Services is not the same as a remote virtual desktop. Virtual desktops running a Windows desktop operating system such as Windows 7, 8 or 10 won’t necessarily provide you with the ability to run Access as a Remote Application (RemoteApp) or via a web browser. 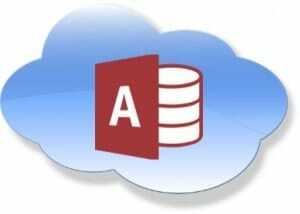 The most cost effective way of using running this Microsoft Access cloud solution is to split the database into front-end and back-end databases, and just use the free Microsoft Access Runtime licence for users to run the front end. Splitting the database is usually quite easy and there is a useful article here that explains more. The database can be run from anywhere in the world over an Internet connection, sharing it with other users and branches no matter where they are. Updated versions of the database only need to be deployed once, not to every PC. Databases should be backed up as part of the service as is the hosted server for added resilience. Hosted servers are usually protected by enterprise level firewalls, redundant power supplies, emergency battery power and diesel generators as well as 24 hour security. They also have central Anti-virus and Windows update management. With hosted services businesses generally pay monthly and can be flexible with the number of users, not being forced to buy software licences that may become redundant. Hosted terminal servers will also allow you to integrate other applications with Access, for example other Microsoft Office application like Word, Excel or Outlook as well as running other non-related applications in the cloud. In fact nearly everything written here applies equally to any other database application, examples include Sage, IRIS, Quickbooks, ACT! etc. In summary hosting Microsoft Access databases online enables companies to run their fully customisable line of business application anywhere, on any device with the comfort of enterprise level security, performance and resilience for about the same price as the very basic (non-customisable) entry level versions of web based online database applications such as Salesforce. Your Office Anywhere have been hosting Microsoft Access and other applications since before the term “Cloud” was coined. All their servers are in the UK in secure Tier 3 datacentres which along with the main business are certified to ISO27001 for Information Security. Customers also benefit from 24/7 UK support for critical issues. A Typical price for Access hosting would be £25.50 per user per month, and most versions will be supported.